Anthony’s pizzeria, named for its owner Tony Balestra, opened about six months ago to little fanfare. The restaurant’s old-school decor is reminiscent of the casual pizzeria-cafés across Italy where neighbours pop by for a cappuccino or a glass of Moretti beer. The truth is, it’s not much to look at — in fact it’s pretty easy to walk by without noticing that it’s no longer the pawn shop that stood in that spot for years. But as more and more people in the neighbourhood stumble upon it, word is spreading about the great Neapolitan pies and family-friendly service. In recent weeks, I saw them turning folks away in the evenings without a reservation. A reservation! I love that Anthony’s sticks pretty much with classic-Italian toppings rather than bending to pressure to make “new world” pies featuring things like duck confit or pulled pork. On the contrary, there are some combinations that are quite unfamiliar in these parts — like potato, peppers, and onion pizza or the tuna one. The thin-but-not-too-thin crust is blistered and charred in the 700-degree wood oven and I think the texture of it is just about as good as it gets in Ottawa — so far. I find the sauce, light and sweet, and the toppings fresh and in proper proportion. 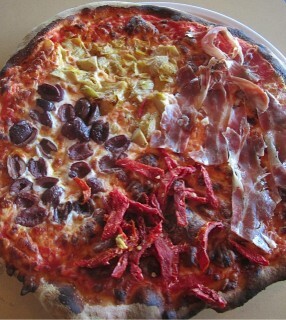 Anyone who has travelled in Italy will get a pang of nostalgia when they see the Quattro Stagione (The Four Seasons), which features four ingredients — in this case, black olives, artichokes, sundried tomatoes, and prosciutto — each occupying its own quadrant of the circle. I love that you get a bit of everything. I understand that customers have been known to request to have the four toppings evenly distributed instead of the way it’s done traditionally. I can’t imagine Tony’s grandmother “Aunt Fil”, who brought the authentic recipe over from Naples, would be too pleased about that. But Anthony is willing to oblige. I’ll mention one more thing. The garden salads on offer at most pizza places are pretty lame, so I was thrilled to discover Anthony’s chopped salad is actually beautifully presented in a modern bowl and filled with a great combination of fresh toppings, tossed with a simple vinaigrette. It’s definitely big enough to split between two people as a starter. 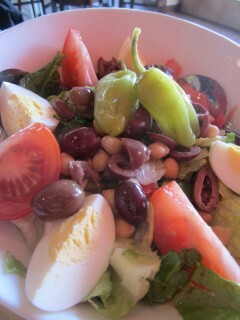 On top of chopped crunchy romaine there was green and red pepper, onion, pitted olives, fresh tomatoes, a handful of chickpeas, and even a hard-boiled egg. Anthony’s 1218 Wellington St. 613-696-TONY (8669).